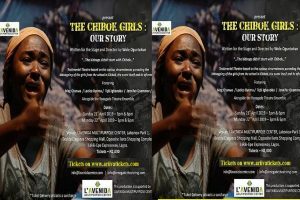 ‘The Chibok Girls: Our Story’ is a stage play that centres around the abduction of more than two hundred and seventy girls from their school dormitory at the Government Girls Secondary School in Chibok, Borno State, on the night of April 14/15, 2014 by Boko Haram insurgents. It is based on actual transcripts by some of the escapee girls and the parents of at least one still missing girl. Through the use of testimonial and documentary theatre, it shows the impact of the incident on the lives of the abducted students, their families, communities, as well as other inhabitants of the North Eastern parts of Nigeria and the country as a whole. Lakeview Park 1, Beside Eleganza Shopping Mall, Opposite Ikota Shopping Complex. Lekki-Epe Expressway, Lagos.